In this lesson, we will learn how to identify a rhombus and learn about its properties. Given that 𝐴 𝐵 𝐶 𝐷 is a rhombus with 𝑚 ∠ 𝐷 𝐵 𝐶 = 4 9 ∘ , what is 𝑚 ∠ 𝐷 𝐴 𝐵 ? is a rhombus. If , find the value of . In a rhombus , and . Find the value of . Choose from the following statements the properties of a rhombus. It has four right angles. It has two pairs of angles equal in measure. It has only one pair of parallel sides. It is a parallelogram of four sides of equal length. It is a parallelogram of four equal angles. If 𝐴 𝐵 𝐶 𝐷 is a rhombus, which line is the perpendicular bisector of 𝐴 𝐶 ? Are the opposite sides of a rhombus parallel? Do the two diagonals of a rectangle and a rhombus bisect each other? Determine whether this statement is true or false: All rhombuses are regular polygons. Which of the following statements is NOT true for ALL rhombuses? AIt is a parallelogram with 4 right angles. BIt is a quadrilateral of sides equal in length. CIt is an equilateral polygon. DIt has 2 pairs of parallel lines. 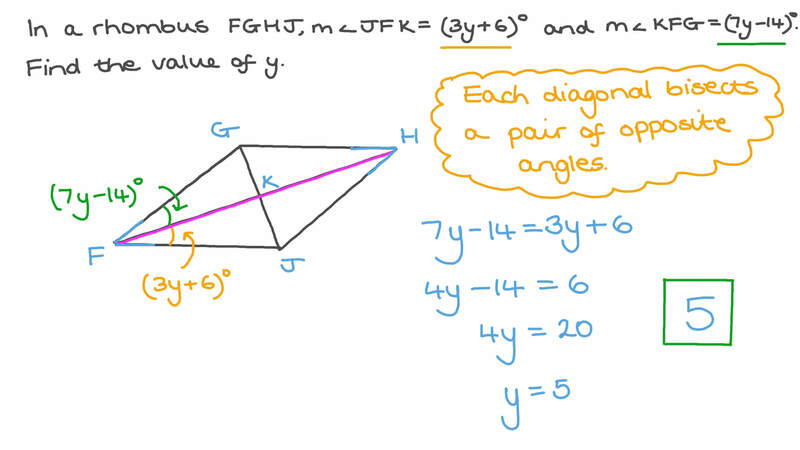 EIt has 2 pairs of angles equal in measure. Determine the sizes of and in the rhombus . In the given rhombus 𝐴 𝐵 𝐶 𝐷 , 𝐷 𝐵 = 6 𝑥 − 8 and 𝑃 𝐵 = 2 𝑥 + 9 . Find the length of 𝑃 𝐷 . The figure shows rhombus 𝐴 𝐵 𝐶 𝐷 . Find 𝑚 ∠ 𝐵 𝐴 𝐶 and the length of 𝐴 𝐷 . In the given rhombus , . Find . 𝐴 𝐵 𝐶 𝐷 is a quadrilateral. The coordinates of the points 𝐴 , 𝐵 , and 𝐶 are ( 1 , 2 ) , ( − 7 , 1 ) , and ( 0 , − 3 ) respectively. Find the coordinates of point 𝐷 if the figure is a rhombus. Determine the perimeter of the rhombus 𝐴 𝐵 𝐶 𝐷 , given that the points 𝐴 and 𝐵 are ( − 5 , − 1 ) and ( − 4 , 4 ) . Given that the points 𝐴 ( − 3 , 3 ) , 𝐵 ( 2 , − 4 ) , 𝐶 ( 9 , − 9 ) , and 𝐷 ( 4 , − 2 ) are vertices of the rhombus 𝐴 𝐵 𝐶 𝐷 , find the coordinates of the point of intersection of its two diagonals. The figure shows a rhombus. Given that 𝑚 ∠ 𝐴 𝑀 𝐻 = 5 0 ∘ , what are the measures of the angles at 𝐴 , 𝐵 , 𝐶 , and 𝐷 ? Is the following statement true or false? In a rhombus, all sides are equal in length. Are the sides of a rhombus equal in length? Are the two diagonals of a rhombus perpendicular? Determine whether the following sentence is true or false: A rhombus has only one pair of parallel sides. In the rhombus shown, determine 𝑚 ∠ 𝑋 , 𝑚 ∠ 𝑌 , 𝑚 ∠ 𝑍 , and 𝑚 ∠ 𝐿 . Are the angles in a rhombus right angles? In which of these quadrilaterals are the diagonals perpendicular but not equal in length? A rhombus is a square if its are equal in length.